For the 2001 parody television series of a similar name, see Dr. Terrible's House of Horrible. 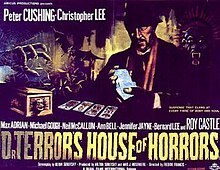 Dr Terror's House of Horrors is a 1965 British horror film from Amicus Productions, directed by veteran horror director Freddie Francis, written by Milton Subotsky, and starring Peter Cushing and Christopher Lee. It was the first in a series of anthology films from Amicus and was followed by Torture Garden (1967), The House That Dripped Blood (1970), Asylum (1972), Tales from the Crypt (1972), The Vault of Horror (1973) and From Beyond the Grave (1974). Five men enter a train carriage in London bound for Bradley, and are joined by a sixth, the mysterious Doctor Schreck (Peter Cushing) whose name, he mentions, is German for "terror". During the journey, the doctor opens his pack of Tarot cards (which he calls his "House of Horrors") and proceeds to reveal the destinies of each of the travellers. This provides the framework to tell five horror stories. Architect Jim Dawson (Neil McCallum) returns to his old family home on a Scottish isle to make renovations for the new owner, Mrs. Biddulph (Ursula Howells). Biddulph explains she bought the secluded house to help her recover from the death of her husband. Dawson finds the coffin of Count Cosmo Valdemar behind a fake wall in the cellar. Valdemar, the original owner of the house, was killed in a conflict with the Dawson family centuries ago. Local legend states that Valdemar would reclaim his former home and take revenge on the current owner. Dawson discovers that Valdemar is rising at night as a werewolf, and has already killed a housemaid (Katy Wild). Believing Mrs. Biddulph to be in danger, he makes silver bullets out of an ancestral cross that protected the house against Valdemar's spirit. When the wolf appears, Dawson is baffled that the bullets don't kill it. Mrs. Biddulph explains that she has replaced the silver bullets with ordinary ones. She reveals to Dawson that the truth of the legend is that Valdemar will take revenge on the last descendant of the Dawson clan, and placing a Dawson corpse in Valdemar's coffin will restore Valdemar to life in human form. It was all a trap: Biddulph is Valdemar's wife, who has returned from the grave after 200 years. Bill Rogers (Alan Freeman) and his wife and daughter (Ann Bell and Sarah Nicholls) return from vacation to discover a fast-growing vine in the garden. When the plant seems to respond violently to attempts to cut it down, Rogers goes to the Ministry of Defence, where he gets advice from a couple of scientists (played by Bernard Lee and Jeremy Kemp). The plant becomes intelligent, and harbours homicidal tendencies towards any threats to its existence. Biff Bailey (Roy Castle) is a jazz musician who accepts a gig in the West Indies, and foolishly steals a tune from a local voodoo ceremony. When he tries to use the tune as a melody in a jazz composition back in London, there are dire consequences. Running from an unknown force, Castle's character stumbles against a wall where there is a garish poster for "Dr Terror's House of Horrors". This story is probably[weasel words] based on the short story "Papa Benjamin" by Cornell Woolrich, which was also adapted by the television series Thriller and the radio series Suspense. The quintet of British jazz saxophonist Tubby Hayes appears as Bailey's backing band. Pompous art critic Franklyn Marsh (Christopher Lee) seems more concerned with his own devastating wit than art itself. Painter Eric Landor (Michael Gough) bears the brunt of one of Marsh's tirades, but gets even by humiliating the critic publicly. When Landor takes it too far, Marsh responds by driving over him with his car, causing Landor to lose one of his hands. Unable to paint any more, Landor commits suicide. Marsh is then tormented by the disembodied hand, which seems immune to fire as well as attempts to contain it, leading to Marsh's eventual blindness in a car accident of his own. Dr Bob Carroll (Donald Sutherland) returns to his home in the United States with his new French bride, Nicolle (Jennifer Jayne). Soon there is evidence that a vampire is on the loose, and Carroll seeks the aid of his colleague, Dr Blake (Max Adrian). They find that Nicolle is the vampire. Following Blake's advice, Carroll kills Nicolle. When the police come to arrest Carroll for his wife's murder, Blake denies giving any such advice. As the police take Carroll away, Blake says to himself that the city isn't big enough for two doctors or two vampires, and he turns into a bat. The frame story ends with a twist. Dr. Schreck informs the men that the only way they can avoid these horrible destinies is by dying first. When the train stops, the men find out that they are already dead, having perished in a train wreck while their fortunes were being told. Schreck is revealed to be Death himself. The film was a conscious attempt by Milton Subotsky to repeat the success of Dead of Night (1945). Subotsky considered that movie to be "the greatest horror film ever," and used it as a blueprint for Dr. Terror and the rest of Amicus's portmanteau films. The script began as a stillborn television series in 1948 during the time when Dead of Night was a recent release. Subotsky wrote the original stories in 1948 when he was employed as a scriptwriter for NBC's Lights Out series. Filming began on Dr. Terror's House of Horrors at Shepperton Studios on 25 May 1964 with a budget of £105,000 and was completed on 3 July 1964. It was released on 5 February 1965. Donald Sutherland was paid ₤1,000 ($10,153.31 in 2018 dollars) for his performance. Dr Terror's House of Horrors was filmed using the cinematic process known as Techniscope. In a contemporary review, Variety noted "a usefully chilly package deal which will offer audiences several mild shudders and quite a lot of amusement. Even though occasional giggles set in, the cast, headed by experienced horror practitioners such as Peter Cushing, Michael Gough, Christopher Lee and Max Adrian, sensibly play it straight." ^ "Dr. Terror's House of Horrors (1965) - Freddie Francis - Synopsis, Characteristics, Moods, Themes and Related - AllMovie". AllMovie. ^ Hodgkinson, Will (13 February 2009). "Blood and gutsiness: the extraordinary story of Amicus studios maker of cheap horror films". the Guardian. ^ Brosnan, John. The Horror People. London, 1976. ^ Fryer, Ian (7 November 2017). "The British Horror Film: From the Silent to the Multiplex". Fonthill Media – via Google Books. ^ Staff, Variety (1 January 1965). "Dr. Terror's House of Horrors". This page was last edited on 27 January 2019, at 13:14 (UTC).